That's a sheeted mosaic tile believe it or not. I registered to attend this year's Coverings recently, that's the tile and stone industry's big trade show. I sat it out last year and in anticipation of this year's show I've been digging through my library and revisiting all the cool stuff I saw the last time. That's where the Petracer's and the Dune posts came from last week. As amazed as I was by those two offerings, what will always stand out to me from that show was the Brix booth. 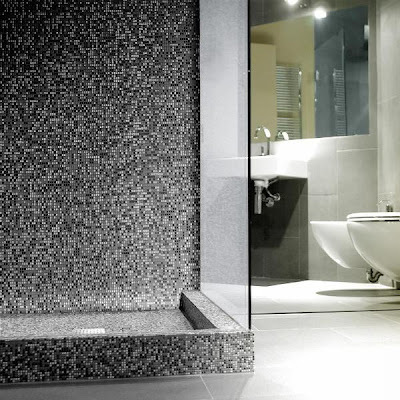 Brix is another tile company based out of Modena but to call them a tile company doesn't begin to do them justice. Brix is a design company that expresses itself through tile is a better way to describe them. One of Brix's coolest products is a tile series developed for them by the architect/ designer Claudio Silvestrin and the series is called i Frammenti. Frammenti means fragments in Italian and the name fits. The series gets its name from the 5mm pieces of porcelain it's made from. Each piece is a nearly perfect half centimeter by half centimeter by half centimeter cube and they are bound together on a flexible, silicone mesh. 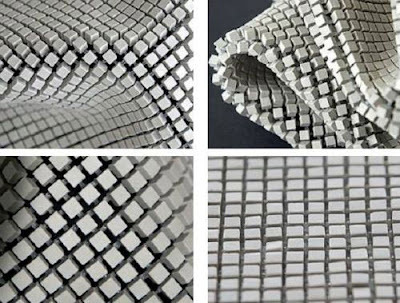 The combination of the small sizes of the individual pieces and the silicone backer make for a mosaic tile that's inherently, amazingly flexible. 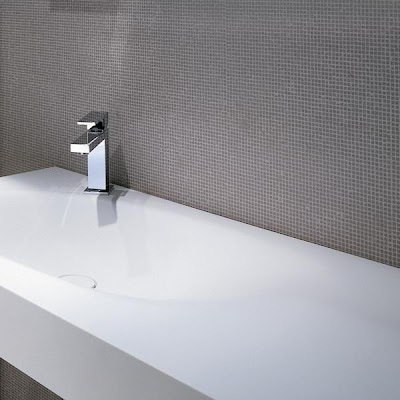 Because it's porcelain, it can be used indoors or out, and in wet and dry areas. The Brix booth at Coverings in 2008 featured a series of columns and other rounded shapes that were covered in i Frammenti mosaics and I'd never seen anything like it. This product and the rest of the products made by Brix are available worldwide through better showrooms. I go to trade shows like Coverings as often as I do in order to keep on top of what new. The Italian manufacturers never fail to disappoint. And that's just the Italian manufacturers who come to the US to show off their wares. One of these days I will make to to Cersaie, in Bologna. Just as an FYI, Cersaie is the international version of Coverings though from what I understand it's in another league all together. In the meantime, you can find more information on i Frammenti and the rest of Brix's offerings here, here and here. Wow! Thanks for the introduction to this tile. I have 1 more bathroom to renovate, so I just ordered samples. PS - Just FYI. I think I found your blog via Decorno. In case you were wondering. Sharon: Thanks for the comment and thanks for letting me know how you got here. I have a sample of the black, gray and white Frammenti that sits on my desk and no one has ever walked past it and not picked it up. It has to be the most distinctive pattern and material in its category. Good luck with your bath renovation! They need to invent a grout sealing brush with 5mm wide clumps of bristles or wheels. That's why we have help David.